The Avengers have taken on evil extra-terrestrials and menacing robots, but even Earth's Mightiest Heroes may have had a tough time surviving the Ultimate Marvel Marathon. The movie marathon, which started at 6 p.m. Wednesday in select cities, brings together all 10 Marvel films before culminating with the U.S. release of "Avengers: Age of Ultron" Thursday night. 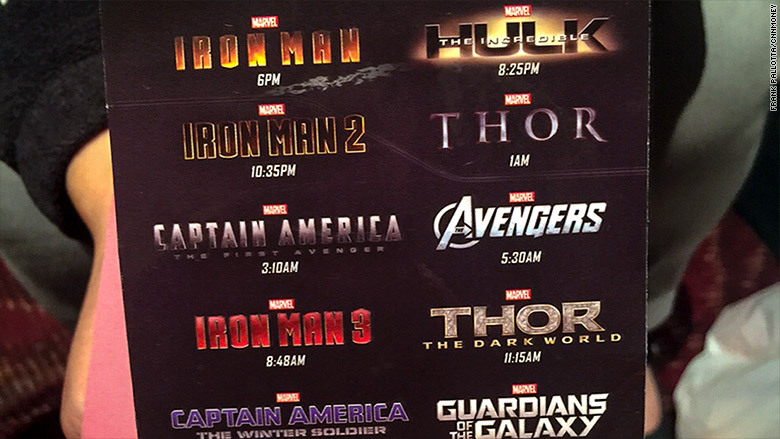 Eleven movies over 27 hours is a task that challenges even the greatest of Marvel super fans. Yet, some brave movie-goers took on the marathon along with its $70 ticket price. By Thursday morning, the concession area of New York AMC Loews Lincoln Square theater looked like a scene after an Avenger's attack with bodies - many in costume or covered with Avenger blankets - prone along the wall or near the popcorn stand. For Craig Held, 25, the franchise's cohesiveness played a big part of his willingness to endure more than 24 hours in a dark theater on a sunny spring day. "It's crazy that they're able to plan something like this, and not have a bum one yet," Held said. "Well except for 'Iron Man 3,' that's why we're napping out here." Held and his friend Kristen Russell, 28, were lying in front of the concession stand as "Iron Man 3" (the seventh film in the marathon) played in a nearby theater. Both Held and Russell said that watching the films in sequence gave them an appreciation for how they were planned out and also stirred anticipation for "Ultron" -- a film that ties it all together. 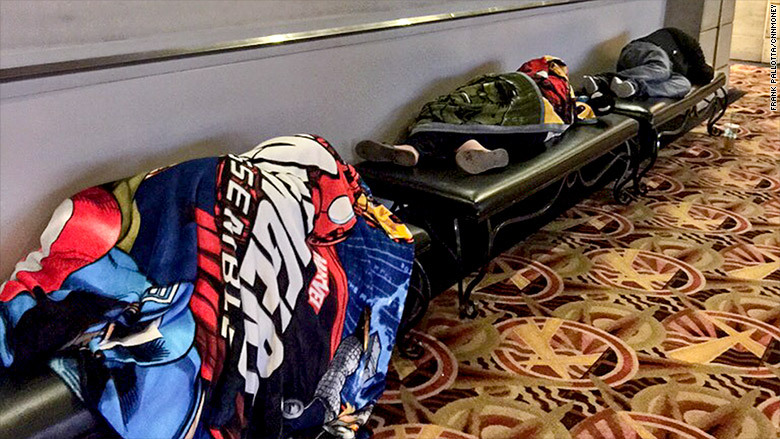 Many fans were sleeping in the movie theater. "Everybody here has such different opinions about the movies. Some people really like 'Thor,' some people really like 'Iron Man,' and ['Ultron'] is appealing to all those different audiences," Russell said. "It's a really good way to make money." And "Ultron" is looking to make a lot of money. Some box office analysts are projecting $220 million for the film's U.S. opening this weekend. This is after the film has already pulled in $255 million since opening overseas last week. For others like Carmen Negron, 44, the marathon was a chance to share her love of the films with her two sons. "For someone my age I remember reading these comic books," Negron said. "I never expected to see anything like this on the silver screen." Negron said her and her two sons lined up at 1 p.m. Wednesday and brought tooth brushes, deodorant, and cell phone chargers. At 9:30 a.m., most of the AMC's more than 700 seat Loews theater was full while "Iron Man 3" played. Despite the action on the screen, many in the packed theater were passed out asleep. 11 Marvel movies in more than 24 hours. 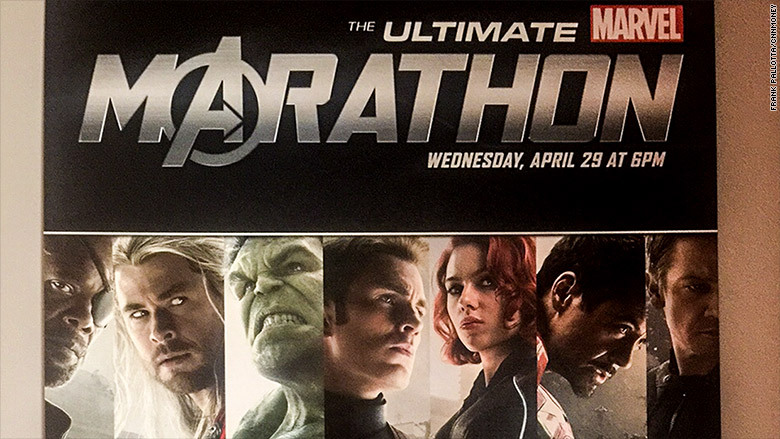 The Ultimate Marvel Marathon is a great marketing tool for Disney (DIS) and Marvel Studios leading to "Ultron," but it's also a testament to the power of the billion dollar Marvel brand. For Disney, "Avengers: Age of Ultron" may just be the start with another of its brands, "Star Wars," renewing its franchise with "The Force Awakens" in December. Marvel Marathoner Joe Murray, 28, said he would gladly sit through another marathon to see the new Star Wars film. "Yes, I would. Definitely," said Murray of seeing a potential "Star Wars" marathon in December. "I'll suffer through the prequels."